Home / Members / Chapter Eternal / In Memoriam: Larry DetersBecome A Member! Harmony Hall is saddened to share that, on January, 12, 2016, past Interim Society CEO Larry Deters passed away. A retired health care CEO in the Nashville area, he was selected to keep Society operations moving forward in the period between the retirement of CEO Ed Watson in July, 2011, and the hiring of current CEO Marty Monson in July, 2012. Larry is fondly remembered by those he worked with here as a dedicated servant of our mission and passionate barbershopper. During this same period, Larry also served as executive vice-president and then president of the Dixie District. A 45-year Society member, Larry had been a member of four districts and held many chapter and district offices, in addition to directing both BHS and Sweet Adelines choruses. 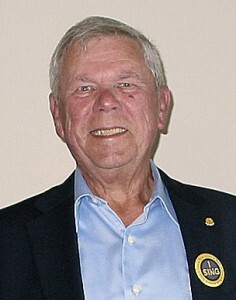 A 30-year member of the contest and judging community in Singing and the former Sound category, Larry judged more than 100 contests. He was a Category Specialist and a member of the Society Contest & Judging Committee. He performed on the International stage in both the quartet and chorus contests and holds a chorus gold medal. A respected leader, Larry has been on the faculty of Harmony University, was a certified Standing Ovation evaluator, and was a certified CDWI instructor. Arrangements are pending, but the funeral will likely take place on Friday, January 15 in Nashville.